Your company is in a precarious position. The marketplace is changing daily. New companies enter the industry. Your competitors are constantly unveiling new products, new services, and/or new marketing strategies. How do you keep up with or even better, how do you anticipate, these changes? That’s where the trade show comes in. Gathered in one convenient location, you should find many, if not most, of your competitors. While industrial espionage is never a good idea, there’s nothing illegal or immoral about asking the booth staff a few pointed questions. The answers you receive can be illuminating and useful, providing the type of knowledge your firm will need to time their new product launch, assess marketing strategies, and so on. Even the smallest competitive advantage can make a huge difference in your bottom line. But how do you know what to ask? Won’t your competitor’s booth staff take one look at you and laugh in your face? Not if you ask the right questions. Realize that some of the answers you are seeking will be provided for you, without you saying a single word. A company’s promotional literature can be a gold mine of information, as can the size, placement, design and graphics of their exhibit. 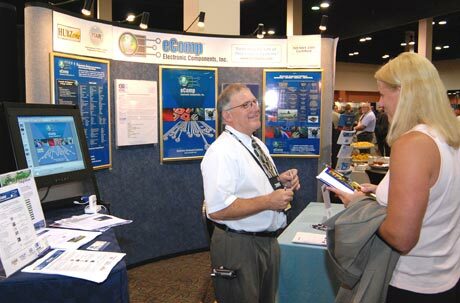 Experienced show attendees can read a booth, discerning a number of valuable facts from these factors. What their reputation and image is in the marketplace. Part of their sales and marketing strategy. Do they pose a threat to my company? Is their booth larger, better designed, more expensive, and filled with substantially more attendees than yours? What is the depth of their product/service offerings? What products and services are they choosing to push at this event? What features are they emphasizing? Make note of important differences between your competitors, especially if these disparities create any opportunities in the marketplace that your company could take advantage of. Product/service features and specifications. Don’t get too technical, or you’ll scare the booth staff off. Ease of product installation and maintenance. Quality and service strengths and weaknesses (or what could be improved). Who are their suppliers? Are they satisfied? Would they consider switching vendors? What are their complaints and unmet needs? What are the key factors in their purchasing decisions? Has the company integrated changing industry technology to create cost savings again, be very general here. If you say “Gee, have you all adopted the new X-7T die cutting laser protocol?” or some other very technical question, they’ll know you’re not just a random attendee. Who do they see as the leaders in the industry? You can tell a lot about a company by the firms it tries to emulate. Some questions are particularly valuable, as they will help you discover the competitor’s market share and learn a great deal about their distribution channels. Pay special attention to any markets that your competitors serve that you don’t what can you learn from their success? Why do customers choose the competitor’s products and services? What do they consider most valuable about the competitor s products? How is their sales staff organized? Would you be dealing with a local, regional, or national sales rep? What market efforts, above and beyond trade shows, does the company engage in? Are they equally represented in all areas of the country or are their regional strengths and weaknesses? Trade Show in a Day: Get It Done Right, Get It Done Fast!